Everyone knows flu is unpleasant and that in some cases it can kill. What many patients won’t know is that if they have asthma it poses another risk – it could cause a life-threatening asthma attack. Asthma UK research has found that for an estimated four million people with asthma, colds and flu trigger the condition. Flu vaccination is a vital way in which people with asthma can protect themselves this winter, but every nurse knows there are barriers to uptake. People may be misinformed about potential side effects, may not believe the flu jab really works, or could have a crippling fear of needles. How can you spread the word about the importance of the flu vaccine to asthma patients and encourage them to be vaccinated? This may seem obvious, but many people may not understand how flu vaccination can reduce the risk of an asthma attack. Some patients may also think they don’t need the vaccination because their asthma symptoms are under control, so the threat of an asthma attack is not at the forefront of their mind. Explain to patients how asthma symptoms and attacks are caused by varying degrees of inflammation in the airways. Viral infections such as colds and flu can increase that inflammation, making the airways more sensitive. Let patients know that even if they don’t normally have symptoms, this increased inflammation could trigger them and lead to a life-threatening asthma attack. Flu infection can also make the lungs more sensitive to other asthma triggers, such as pollution or allergens, so having the flu vaccination adds an extra layer of protection. We know anecdotally that a significant number of people are worried about side effects and believe they can catch the flu from having the vaccination. Explain to patients that this simply isn’t the case, and that it is better to deal with a small chance of mild side effects such as tiredness, headache or tenderness around the injection site than risk spending a week with flu or having a life-threatening asthma attack. Some patients may not think that the flu vaccine is effective. Advise them that the World Health Organization updates the vaccine every year to tackle the most prevalent strains. That’s why it’s so important for patients to get a new flu vaccination each year to stay protected. Others may not believe that the flu jab is effective because they have had it previously and still got the flu. This is not because the vaccine is ineffective but because there are many different strains of the flu virus, and the vaccine may not be an exact match for all of the strains. 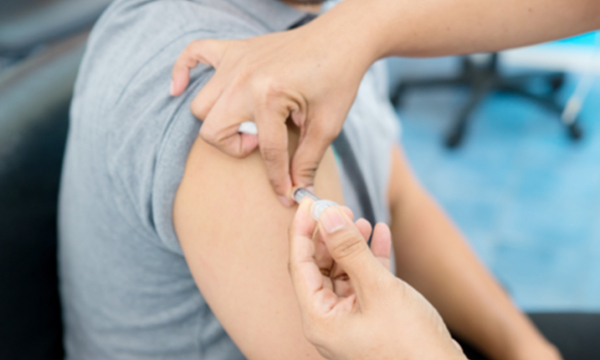 The vaccine can also take up to two weeks to take full effect, so it’s possible for patients to get the flu in the period before they are fully protected. To avoid this, advise patients to get the flu jab as early as possible, at a time when the virus isn’t as prevalent. Nurses can direct patients who are still hesitant about getting the flu jab to Asthma UK’s vaccine myth buster for reassurance. They are using preventer medicine. They have needed oral/systemic steroids. They have had a previous hospital admission. Those with some other long-term conditions. Everyone with asthma could benefit from having a free flu vaccination, so encourage patients to get one even if they feel their asthma is under control. If avoiding the flu jab is simply down to a question of convenience, let patients know they can also get the free vaccination at their local pharmacy. This is a great option for anyone who is pressed for time, as they can do it in their lunchbreak or before or after work. For those ineligible for free vaccination, pharmacies offer it for £10-20. Remind patients with asthma that the most important thing they can do to stay well is to take their preventer medicine as prescribed. This helps to address underlying inflammation in the lungs so they will be more resilient if they come into contact with an asthma trigger such as flu. Make sure patients have a written asthma action plan and are attending their yearly asthma review. All these things will help to protect them against having an asthma attack, but only having a vaccination will help prevent flu. Fear of needles, or trypanophobia, can be crippling, and for some patients it can be a barrier to getting the flu jab. It’s important that everyone with asthma gets the vaccination, so discuss alternative options with reluctant patients. You can also help patients to relax by showing them some breathing exercises, or use a topical anaesthetic if they are worried about pain. Advise these patients to avoid looking at the needle while the vaccine is prepared and the injection takes place. Ensuring that patients are well-informed about the risk of a life-threatening asthma attack after contracting the flu virus, and reassuring them about the benefits of receiving the vaccination could keep them safe this winter.